Neatorama had an interesting piece recently called, "Who owns what on television?" I was facinated to see how a few corporations control most of the big media outlets. I think I probably already knew this, but seeing it all laid out was pretty eye-opening. If I were teaching at the moment, which I'm not cause it's the middle of summer vacation, I'd bring this up as a topic of discussion. As an example, the graphic here, shows all the stations owned and operated by Time Warner. I'll bookmark this page and come back to it in September to show my media classes. Last winter we had a storm that took out about a third of the branches on an ornamental plum in my back yard. All the area that is clear sky in the first picture was filled in with lovely foliage. 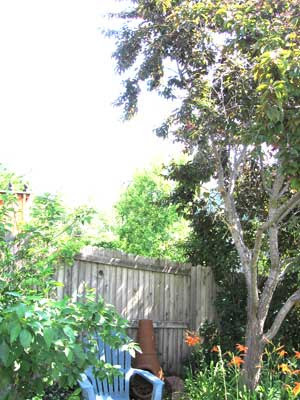 There is a chair there sitting below the tree and it's empty because what we used to call the "shade garden" has now become one of the sunniest spots in the yard. I used to go there every morning with a cup of coffee and watch the flowers grow. Now I go there to work on my tan. The orange day lilies are the only happy recipients of this change. They like their bed a little sunnier and have given us a great show of color this year. But, day lilies are not the boss of me! I want my shade back. While trimming the dogwood to the left of the tree last week, I cut out a nice sized cane that had a beautiful "v" shape to it. I was wishing I could magically graft it onto the plum when I noticed a long sucker coming up along the trunk of the plum where my shade branches once waved proudly. I was about to prune it off when I remembered how my wife and I had once shaped the angle of branches on some young fruit trees. 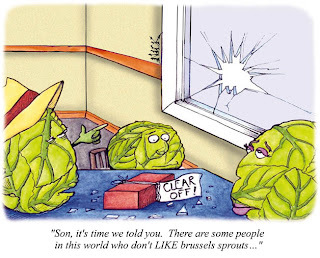 We learned this from an episode of Victory Garden years ago. Essentially you can guide a trees growth by forcing the young branches to any shape you want by attaching them to forms or lengths of wood. I grabbed the dogwood branch and cut it into a more manageable size. 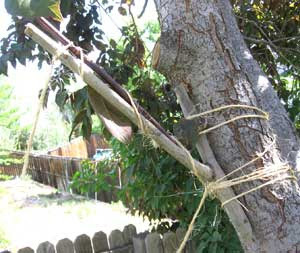 I then tied it to the plum trees trunk and gently bent the sucker to match the "v" shape of my dogwood guide and tied it down. You can see my sloppy rope and knot work in the picture below. If this works, the branch should grow out into the open area and in a couple of years give me the shade that I miss. I'll check the branch this fall and decide then if I should remove my guide or not. I may leave it on to give it a little extra strength over the winter months. Check back in September for an updated picture. My knee has been giving me problems the last few months. I fell during a hike a few weeks ago and that made me decide I needed to do something a little different. What might that be, you ask? Go to a doctor about my knee? 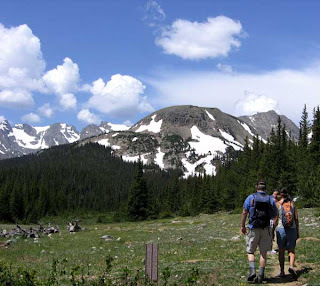 Hike those flat boring trails around lakes and such? Nope. I decided to buy some hiking poles. 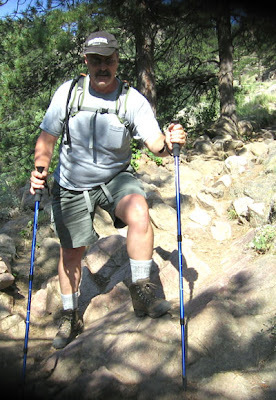 I've seen many hikers using these poles recently and had a couple of friends recommend them. I figured they couldn't hurt. That is until I looked at the cost for poles being recommended to me. Yikes! I finally decided on the ones shown here mainly because of cost. If I bought them and found out I didn't like them I wouldn't be out a hundred bucks (or more). These two set me back about $30. I picked them because of (1) price, (2) they seemed solid when I put all my weight on one and (3) the grips were comfortable. The section of trail shown here is an example of some of the hardest terrain I might run into in my hikes. Not quite steep enough that you would have to scramble (use your hands). Lots of places where it's like you are climbing stairs only the risers make you lift your foot higher than 10 inches. 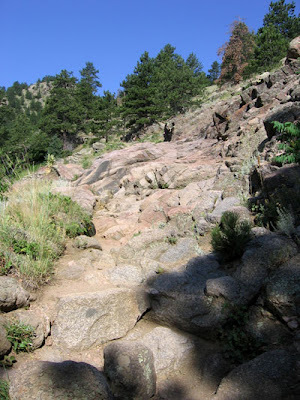 This trail leads to the summit of Green Mountain just outside of Boulder,Colorado. 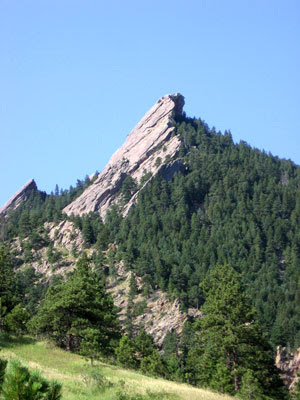 It is part of a series of trails that start at Chautauqua park right on the outskirts of town. 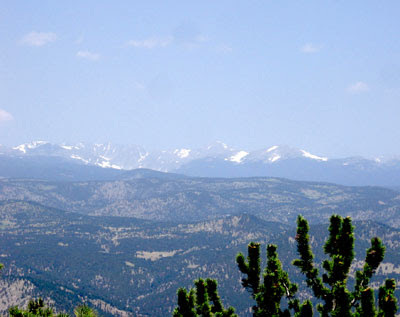 From where I live (in suburb of Denver) I can reach the trail head in about thirty minutes. It's where I go when I want to hike but don't want a long drive. I thought it would be a good place to try out my new poles. I started off up the trail and for about the first 10 minutes, I hated them. They felt awkward. I had to get the hang of where to place them so I wouldn't trip over them. They were noisy. Every time their metal tips hit the ground they made a "thok" sound or if it was rocky "tink". "Thok thok thok thok thok tink tink tink thok tink thok." There was no way I was going to sneak up on anybody this way. 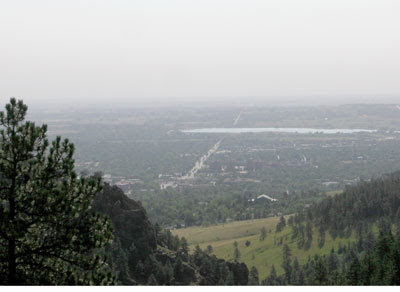 About the time I got to this vista looking back over Boulder, I started to change my mind. My balance was better. Even with my tender knee, I never felt unsteady. Going up stair step type formations in the trail were much easier because I could use a little arm strength to help me out. It was like having built in rails. By the time I got to the top of the mountain and could look out over to the veiw to the east (the last picture), I was sold on them. I'd be using these for at least this season. On the way down, I lengthened the poles and found they were just as helpful. Going down usually hurts my joints more than going up. I have to say, it seemed to be less stressful on my knees, once again because I was taking some of the weight with my arms. I did take one nasty slide on the way down on some loose gravel and put all my weight on one of the poles to catch myself. It bowed but did not crumple and I was able to regain my footing without any embarrassing falls on my posterior. So here is what I think from one hike. Take some getting used to especially where the trail narrows. In areas where it is narrow and surrounded by brush, they can get tangled up with your legs and make you curse. Curse bad words that your mother would be dissapointed to hear you say. Stopping to take a drink, blow my nose or take a picture was a bit of a bother. Too many things to juggle. Made going up and down stairstep formations much easier. Worked nicely in areas where I was moving from rock to rock. Helped me keep my balance while I checked for footing. What do I think about my cheap poles versus some of the more expensive ones? Not sure yet. Let me get a few more miles on these and I'll let you know. Adam Pesapane is the animator and brains (camera?) 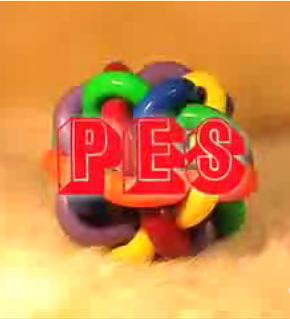 behind PES. One thing I love about these films are their use of everyday objects presented in a different way. Clown heads become the flame discharge on a gun (Kaboom). Post-it notes become pats of butter (Western Spaghetti). He also has a few films that aren't stop motion. For example, "Dogs of War" intermixes some old war footage with modern footage to great effect. I'm going to show this clip to my video students as an example of good editing. I've embedded a short video from the site made by Adam on the making of "Kaboom". He explains some of the objects in the film and why he used them. This video by itself is a nice piece of film making. Head over to the site and spend an hour or so watching some great little films. We don't need no stinkin' tent poles! We laid the tent out flat in a perfect place and staked the corners down. My friend (who shall remain anonymous as I don't want to disparage her reputation in any way) and whose tent we were trying to put up said, "I don't see the support poles." "The ground between here and the car? Your other bags? Under the car?" "I did, I did, and I did!" She crawled into the tent and laid inside the puddle of canvas with her face pushed up against the mesh of one of the windows. She said, "This isn't so bad. We could just sleep in here like this." The day before leaving I had taken the rope I usually carry out of my camp box in an effort to consolidate. I should have left out the bottle opener. I never need to open a bottle anymore....pretty much everything I drink now comes out of a pop top. I said, "There has to be something we can use to suspend the tent at least a little bit." We dug through our supplies looking for twine or string. Finally, staring at my camp box, I realized that the two straps holding the lid on might be able to work as a single support if we could get the tent under a low enough branch. I told my friend (who I have now given the nickname of "Tent-Pole -Girl" which is a friendly mocking way to remind her of her mistake, after all, isn't that what friends are for?) "Hey Tent-Pole-Girl! We need to find a low hanging branch. Maybe we can use these to hold up the center of the tent." I held up the straps. "Cool and don't call me Tent-Pole-Girl......Old Man." "Sticks and stones, yadda, yadda, yadda! Find a tree....Tent-Pole Girl." "Old Man Who Forgets Everything." "Old Man Who Has a List of Every Picky-Uny Thing." "Tent-Pole-Girl who might have remembered the tent poles if she had a list!" "Old Man who.......oh wait. How about this branch?" She pointed at one that wasn't too far from the original campsite. "Pretty good. But the ground is a little slanted." "You're right. Lets give it a try." We jury rigged something that allowed us to suspend the tent at least enough to get it off our faces. We couldn't figure out how to completely get the rain tarps on the tent. If a storm came, we'd have to relocate to the car. 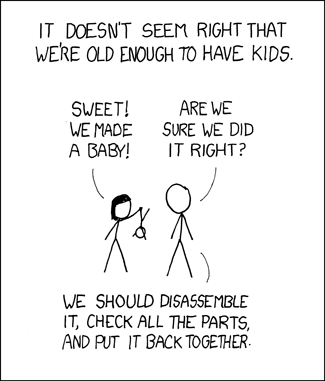 Other than that it was workable. "Yes, I know Tent-Pole-Girl. With age comes wisdom." "No. Really. You amaze me." "Enough Tent-Pole-Girl. You are embarrassing me." "OK...but I just wanted you to know what I thought. And one more thing..."
"Yes, my admiring young friend who is in awe of everything Al." "Call me Tent-Pole-Girl one more time and I will rub raw bacon on your sleeping bag and you can discuss your cutesy nick names with Smoky the Bear when he comes looking for a pork treat in the middle of the night!" As it was, other than sliding down the slope to the bottom end of the tent and having to scootch back up once or twice every hour, the night was a peaceful one with no rain. We woke early the next morning and went for a hike in the Poudre Canyon. Our new motto: "We don't need no stinkin' tent poles!" Thanks to Neatorama for the link to this clip. Beautiful shot taken on the Sourdough trail near Ward, Colorado. Ran across this fellow eating aspen bark while camping near the Poudre Canyon in Colorado. 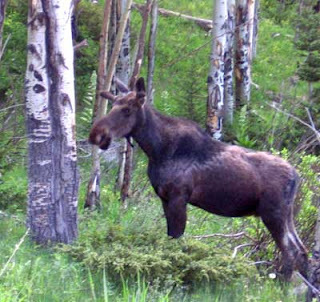 I've lived most of my life in this state and it's the first time I've ever seen a moose in the wild here. There is another one a little further back in the brush that was camera shy, but this young bull struck this pose just for us. How many times have we had to sit through the million thank yous that need to be said at the beginning of a big meeting or conference. It's important to acknowledge the folks who put a program together but for most of us sitting in the cheap seats, it has little or no meaning. I ran across this great idea on Cool Tools that was described by Seth Godin on his blog. "Let's give a big hand for all the folks who put so much work into making this thing happen. Yeah baby!" OK, the Altoids themselves aren't going to save your life, except in the case of a really important blind date and the unfortunate loss of your toothbrush. The idea here, is that the tin itself can be turned into a container for a handy little survival kit. 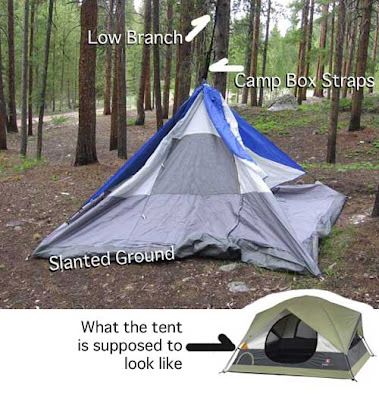 Ron Hood, a survival expert, designed this set-up and briefly explains the reasons behind most of the contents. He mentions the "Rule of Threes" but didn't elaborate. I couldn't easily find any information regarding this on his site, so I did a web search and found many places that mention the concept. This page had an understandable explanation. Briefly, The Rule of Threes refers to the general parameters that you can live three minutes without air, three hours without shelter, three days without water, and three weeks without food. When going out into the wilderness supplies should reflect this thinking. Pack and plan accordingly. 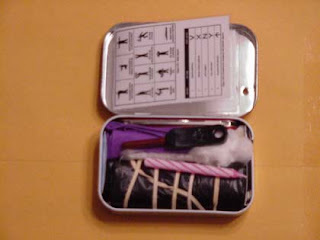 The Altoids survival kit was designed with these rules in mind. Hood has something called the "Survival Cheat Sheet" in his kit. I found a link to a pdf file and printed it out. It's font is way too small for my old-man eyes and would be useless to me out in the wild. Further searching led me to this Army Survival Manual. It looks like some of the material in the cheat sheet was pulled directly from this source but it's 646 pages would be a bit bulky for an Altoid tin. If anybody has a source for a "cheat sheet" that is a little more legible, leave a response. Lastly, remember that I am a school teacher who has never had a survival experience other than being dropped into a classroom of rowdy 7th graders. My best advice in a situation like that is to give each child an Altoid and pray for the bell. If you head out into the wilderness with a tiny-tin of supplies because I thought it was cool, you may be cursing me with your last breath as you lay dehydrating in the summer heat. Ask someone who knows first! Remember.....I am the guy who heads out into the woods with a camp box the size of a baby rhino. Condensing everything down to one Altoid tin blows my mind.